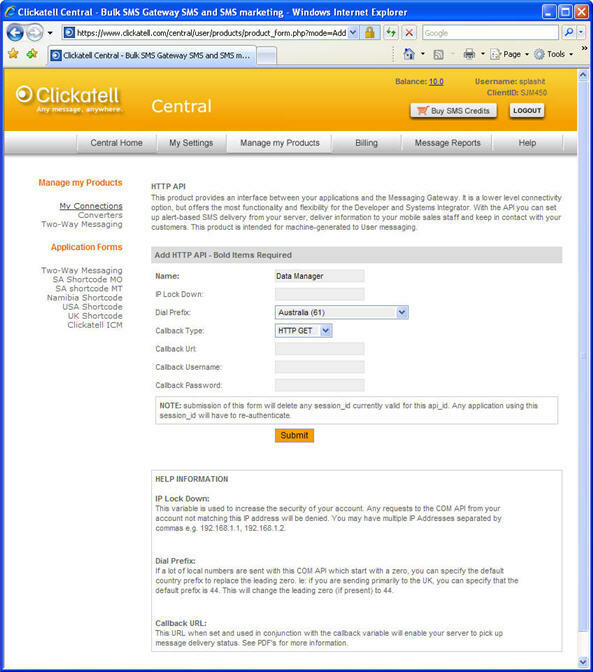 If you are using Clickatell as your SMS Gateway within fmSMS in addition to entering your Clickatell username and password you are also required to enter your Clickatell HTTP API ID. (If you are using fmSMS with the Clickatell US Small Business service please visit our dedicated page for more details – the HTTP API ID should already be setup and you will need to enter this into fmSMS along with your dedicated two-way number). 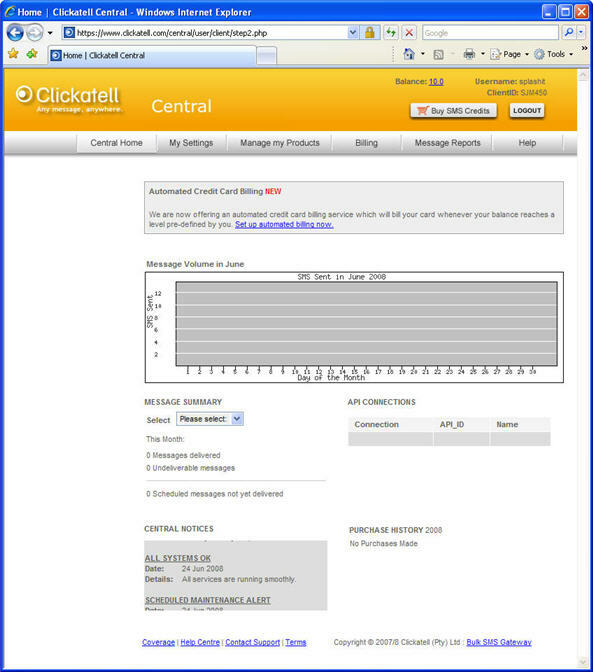 Clickatell provide you with 10 free message credits which you can use to test fmSMS. 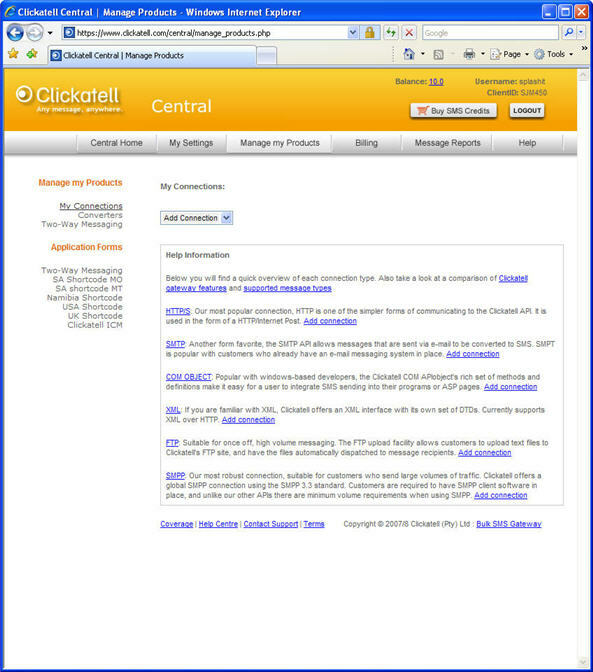 Once the Clickatell website has appeared click the Sign Up Now button and enter your details into the Personal Information form (Step 1) and click Continue. Make sure you make a note of the username and password you enter. You will now be at Step 2 – Verify your Identity. Clickatell will send an SMS to the mobile phone number you entered at Step 1 with the Clickatell Activation Code and also an email to the email address you entered with a Clickatell Verification Code. Enter both the SMS code sent to your mobile phone and the Email Code sent to your email address and click Continue. You will now be logged in to the Clickatell website. Your SMS credits balance appears at the top of the screen as well as your Clickatell Username and ClientID (generated by Clickatell). Make a note of both of these as you will need this to log back into the Clickatell website in the future to view message logs, purchase credits or additional services from Clickatell. You now have your Clickatell Username and Password – you also need a Clickatell API ID to complete the Clickatell registration process. Click the Manage my Products link at the top of the page and then select HTTP from the Add Connection drop down list that appears. You can enter “fmSMS” for the Name and click Submit. You can now enter these into fmSMS via the SMS Gateways screen on the Account Tab. Enter the Clickatell HTTP API ID in the Custom Text 1 field. 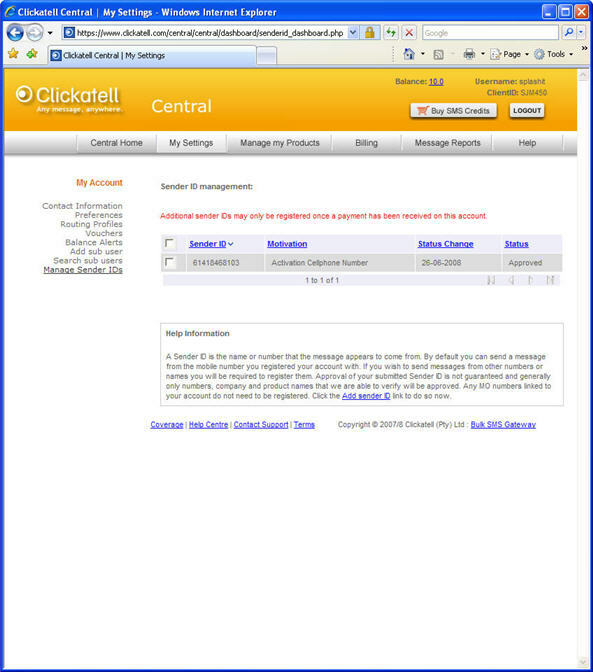 Remember to make a note of the Clickatell ClientID which appears in the top right hand corner of the Clickatell website when you are logged in – you should also receive an email from Clickatell with your account details which you should file for future reference. When you send a SMS/TXT message from fmSMS you nominate which Sender ID to use as the sender of the message. For each user you enter their mobile phone number in the Senders screen which determines the number the message will appear to have been sent from (remember to the recipient it appears as if the message was sent from the mobile phone handset of the sender) and therefore where replies to messages will be sent. During the 10 credit trial period you can only send messages from the number that was entered during the creation of your Clickatell account – you will need to purchase credits to add what Clickatell call Sender ID’s. A Sender ID is the name or number that the SMS/TXT message appears to come from. By default you can send a message from the mobile number you registered your account with. If you wish to send messages from other numbers or names you will be required to register them. Approval of your submitted Sender ID is not guaranteed and generally only numbers, company and product names that Clickatell are able to verify will be approved. In order to prevent illegal spoofing you are required to register any sender IDs that you may wish to set when sending a message. This is an important feature as it prevents you from masquerading as someone else and sending a message from a mobile number which does not belong to you or one of your staff. Once you have purchased additional credits via the Clickatell website you can then add additional Sender ID’s (remember the mobile phone number you entered during the creation of your account is already setup as the default Sender ID). To add additional Sender ID’s click the My Settings button at the top of the screen when you are logged into your Clickatell account via the Clickatell website then click Manage Sender IDs to see a list of all the current registered Sender ID’s. Click the Add Sender ID button to add a new Sender ID and enter the new mobile phone number in the international format (for example if the number was an Australian number 0412 345 678 you would enter 61412345678) and click the Submit button. An Activation Code will then be sent to the mobile phone – follow the instructions to enter the Activation Code to activate the new Sender ID.